Be the first to share your favorite memory, photo or story of Gracie . This memorial page is dedicated for family, friends and future generations to celebrate the life of their loved one. Gracie Marie Hill, 89 of Bella Vista, passed away Friday March 29, 2019 in Bella Vista. She was born January 18, 1930 in Mount Judea Arkansas, the daughter of the late John and Ellen Sullivan Duck. She was a homemaker and was a member of the Church of Christ in Bentonville. She is preceded in death by her husband of 52 years Thomas Jefferson Hill; sisters Lucille Smith, Lillian Waters, Frankie Boyles and Laura Cook, two brothers William Eugene Duck and Harvey Dale Duck. 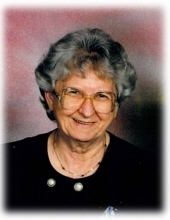 She is survived by her daughter Tammy (Maury) Rothfus, two grandchildren Tiffany (Scott) Wood and Cheston (Stephanie) Rothfus, one great-grandchild Addison Belle Wood, two sisters Joan Edwards of Harrison, Shirley (Tom) Harriman of Springdale, two brothers Jearl (Ruth) Duck of Harrison and John Duck Jr. of Osceola, many nieces and nephews. Visitation will be held 10:00 a.m. Wednesday April 3, 2019 at Benton County Funeral Home 306 N. 4th St. Rogers, Ar. Funeral Services will follow at 11:00. Interment will follow at Bentonville Cemetery, Bentonville Arkansas. In lieu of flowers because of her love for children donations to The Arkansas Children’s Hospital of Northwest Arkansas. To send flowers or a remembrance gift to the family of Gracie Marie Hill, please visit our Tribute Store. "Email Address" would like to share the life celebration of Gracie Marie Hill. Click on the "link" to go to share a favorite memory or leave a condolence message for the family.